This evening I called Shaun and told him I needed him to hurry home from work to rescue me. 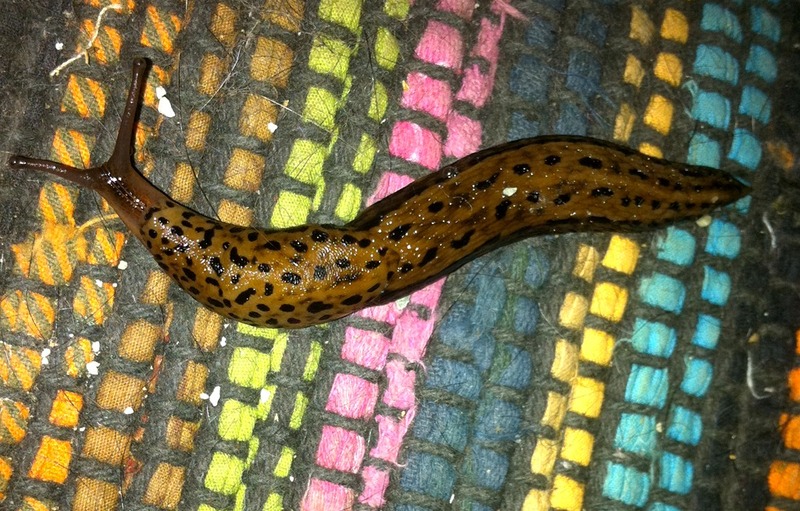 We had been invaded by a Man Eating Slug. I had to keep an eye on it to make sure it didn’t get too far. Trust me, they move a LOT faster than one would think. There was no way I was leaving that wild beast alone and on the loose in the house. I had to do something besides perch on the end of the coffee table while waiting for my Knight to arrive. It’s amazing what great photos my phone will take…from a safe distance of course. I’d like to say that my gallant hero rescued me. Well, I can say that, because he did. But not before he put the slug near my leg (causing me to get all girly and scream) and now of course, I have to put up with endless teasing. This entry was posted in Critters, Love and Marriage, NaBloPoMo. Bookmark the permalink. Oh I would have slugged him. 😉 Those are wonderful photos .. especially for a phone. I’m pretty impressed with my phone pics. Actually I’m just pretty impressed with my phone! If I had “slugged” him, he’d get even in the worst possible way! Is it now housed in a new location downstairs with the rest of the varmints?? What will you feed it? I was actually thinking of bringing it over to you. That way you can feed it whatever you want! @brenda: Remeber, it is a man-eating slug, so it eats people… and it lives in a loosely-sealed jar under Susan’s side of the bed. 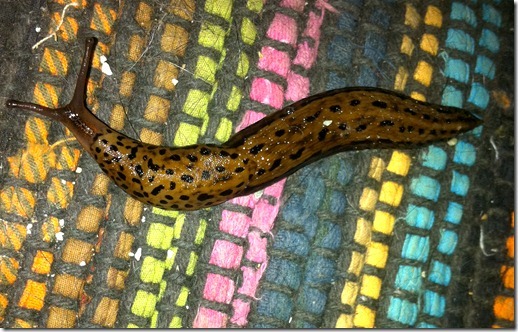 Slugs just completely gross me out. Ugh. Are there many slugs down there now? I don’t ever remember seeing them, just lots of snails. Which are just as nasty. Susie!!!! It is a slug salt does wonders on it and it will never bother you again. Ewww…I’m not sure which is worse…a salty puddle of slug or the real thing! I used to walk barefooted home from (work many years ago, when I was a lifeguard) until I stepped on one of those suckers! Believe me, it felt a lot more disgusting than it sounds — and it SOUNDS disgusting! As slugs go, it really is a good looking one. I think your slugs are better looking than ours. Banana slugs? Have you got those? yikes….that thing is huge ! I am so glad that you were saved from this near death experience…and that you captured such good pictures with your phone. 🙂 Congratulations on POTW mention at Hilary’s! 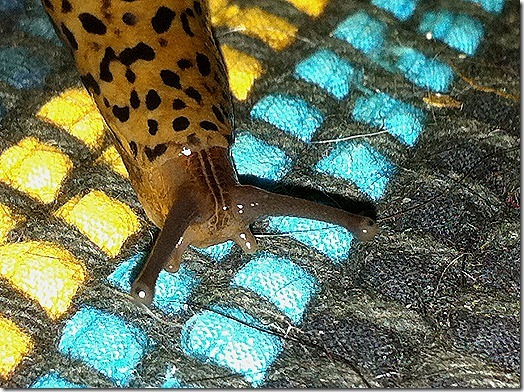 LOL, I have never appreciated a slug before — but with this post, I almost do! It is fascinating to see a great close-up photograph, but I will never get over my childhood experiences. It was bad enough walking to school on wet, rainy mornings when there were so many slugs that it was difficult to not step on them. Ewww!!! The neighborhood boys would tease the girls with caterpillars and slugs in the summertime. There is nothing more awful than one of those things in your hair! Yikes. That’s a big ‘un. And a funny story. Congratulations on your potw. One night last summer, as I stepped out onto the back porch, I felt something under my bare foot, just funky enough that I didn’t put my weight on it and popped in to turn on the outdoor light. Two of those bad boys. I am so glad I didn’t wind up cleaning squished slugs off my feet. Bleah. Me no likey slugs either, but would never have waited to be rescued…. I think my broom would have worked nicely at shooing away the intruder. I screamed as soon as I saw it! I am SO sorry your knight TORTURED you by putting it on your leg first. Boys! I am also SO glad you didn’t leave it alone for even one moment…can you even imagine what might have happened to it unattended. EEEEK! First of all, congratulations on your POTW mention! And second, those are awesome photos of that slug. I’ve never seen a real one but a friend of mine (on Bainbridge Island, WA) has a fake one that looks exactly like that!! I think it’s really pretty, actually. So I’m guessing you wouldn’t even want a fake slug? So funny. 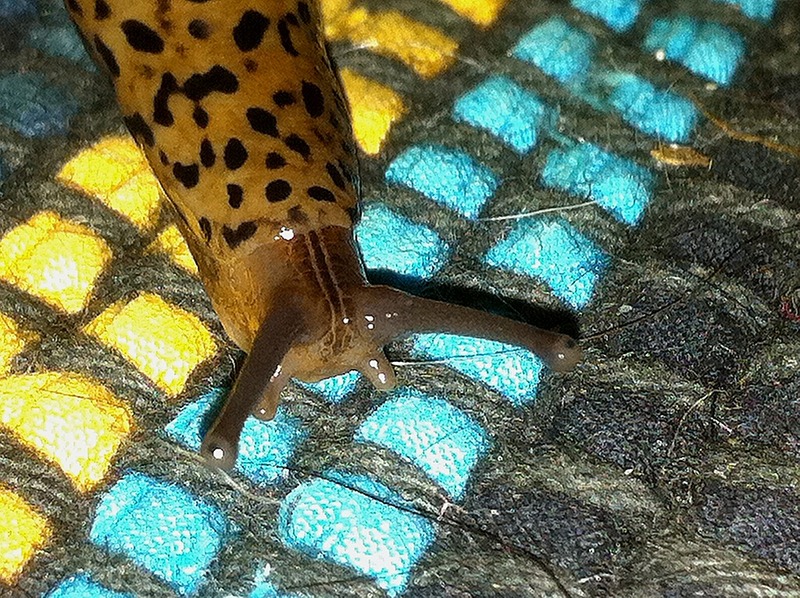 Great shots of the man-eating slug, especially considering that they were taken with a cell phone and under duress. Congratulations on POTW.